Get 100 percent completion and unlock all endings for Fugitive in Detroit: Become Human. This walkthrough will provide details for 100 percent completion of the Fugitive chapter in Detroit: Become Human. This includes details about how to unlock all the chapter’s endings. To provide this information we must talk about the story, which means anyone looking to avoid spoilers should back out now. Our so-far 82% complete flowchart for Fugitives. Fugitives is yet another chapter in Detroit: Become Human that presents players with a lot of branching choices and activities. We're still trying to discover all of the different decisions and activities, particularly within the supermarket, but all of the mission's choices ultimately lead to one of three largely similar endings. Read "Bee Line to Disaster"
This ending is standard for the Fugitives chapter. It requires that Kara steal clothes from the laundromat, and that she takes money from the cash register at the convenience store (gun from Stormy Night optional). From there it’s just a matter of renting a room at the motel and going to sleep. This will result in a chase in the On the Run chapter. This ending is probably the fastest that players can unlock in the Fugitives chapter. Alice and Kara can head straight to the abandoned car, get inside, and get to sleep. This stops them from having to interact with the employees at the convenience store or motel, and thus their location should remain unknown. To stay in the abandoned house, Kara must steal the wire cutters in the convenience store (only possible if she’s discovered the fence near the abandoned house), or she can take the wire cutters from near the abandoned car. Kara must also deal with Ralph to stay in the house, but he’s harmless. If Kara took the gun in the Stormy Night chapter, she can use it here to deal with Ralph. With Fugitives 100 percent complete and all endings unlocked, the next chapter is From the Dead. 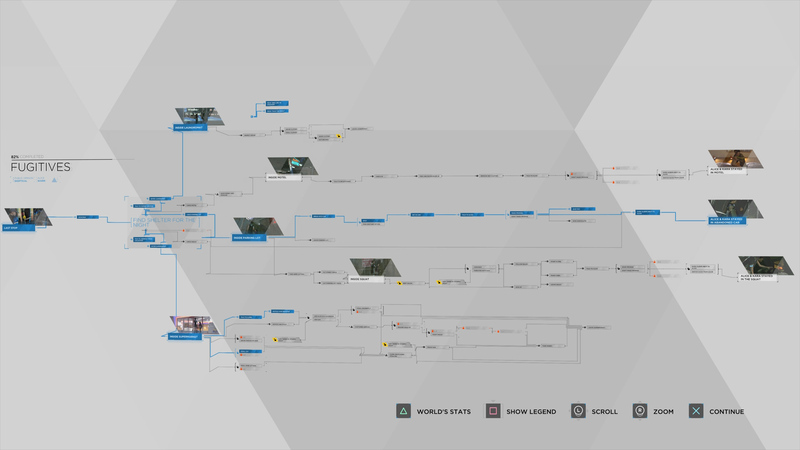 If there are other chapters that need completing first, be sure to head over to our Detroit: Become Human 100 percent walkthrough to browse through details on each one.